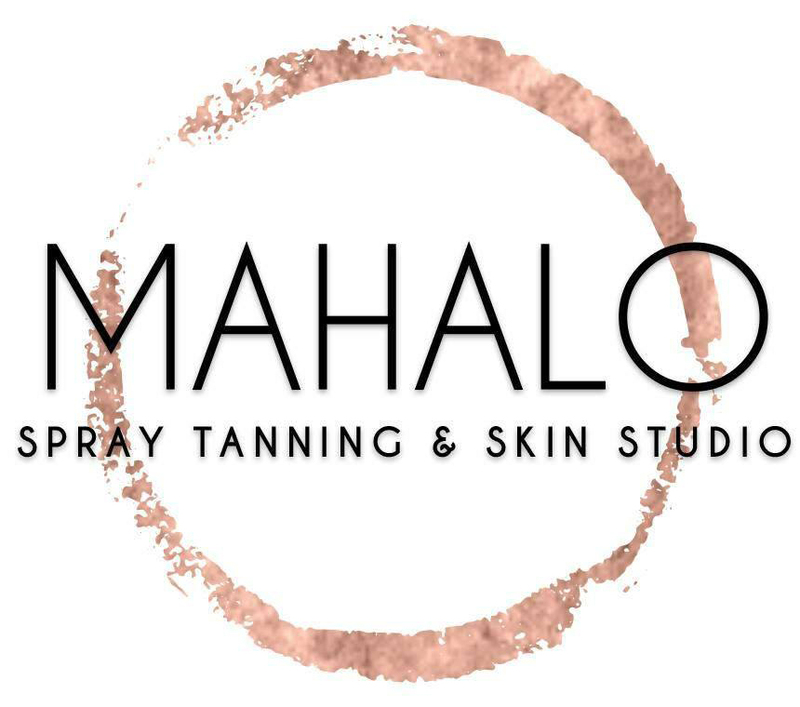 At Mahalo, our spray tans are applied by a professional spray tan technician using a hand held applicator. The solution contains DHA (Dihydroxyacetone) which reacts with the proteins on the outer layer of the skin and turns a golden brown. Because the solution is only on the outer layer of the skin, it lasts as long as your skins natural exfoliating cycle. Your skin should be clean, dry and hydrated for best results. You will want to shave and exfoliate 24 hours before your appointment. Shower the day of and avoid using perfumes, oils and lotions that can act as a barrier to the solution and disrupt the ph levels of the skin. (Tanning solutions cannot be applied to peeling skin or open/cracked skin) We will provide make up remover wipes if you need them as it is best to have clean, make-up free skin for the application of your tan. WHAT SHOULD I WEAR TO MY SPRAY TAN? It is best to wear loose fitting dark clothing after your spray tan. The solution can rub off onto your clothing and although in most cases it washes out, it is best to chose dark items that can be easily washed. Please wear or bring whatever you wish to wear during the application of your spray tan. Some people chose to wear a bathing suit, undergarments or the disposables that we have available in the studio. Flip flops are also recommended to wear after your appointment. The typical spray tan will last 7-10 days with proper care and upkeep. It is important to follow the suggested steps to get the best quality tan possible. HOW SOON AFTER MY APPOINTMENT CAN I SHOWER? Many of our solutions have an 18-24 hour rinse time. You will want to avoid showering, sweating or getting wet until the day after your spray tan. You will also want to avoid moisturizers and liquid make-up. For your first shower, it is best to do a luke warm rinse and avoid using harsh soaps or cleansers. I HAVE A SPECIAL EVENT, WHEN IS THE BEST TIME TO SCHEDULE MY SPRAY TAN? We recommend scheduling your spray tan 48 hours before your event. You should plan to allow plenty of time for the tan to fully develop (18-24 hours) before your first shower. However, if you have an event and want to schedule your spray tan for the same day, we do offer a quick tan appointment which can be rinsed off after 1-3 hours. CAN I EXERCISE AFTER MY APPOINTMENT? Exercise should be avoided for the first 48 hours following your spray tan. Absolutely not! Our solutions contain high-quality DHA and are considered the best on the market. Our technicians are licensed and experienced spray tan artists. You will want to shave and exfoliate 24 hours before your appointment. Shower the day of and avoid using perfumes, oils and lotions right before your appointment that can act as a barrier to the solution and disrupt the ph levels of the skin. We also suggest having any hair or nail appointments done prior to your spray tan if possible. Please arrive at your appointment with clean, dry skin. You will want to have loose fitting, dark clothing to wear home, along with flip flops. Please be prepared for inclement weather with an umbrella and clothing to protect your tan in case of rain or snow. You want to avoid using any soap or lotion until your first rinse.. After that time, it is recommended to use a professional ph-balanced soap and moisturizer that are made safe for your sunless color. Always pat dry after showering and avoid rubbing vigorously. Non-professional approved moisturizers include natural, fragrance free products such as 100% Shea Butter. Avoid using perfume directly onto the skin as it will cause unfavorable fading. Avoid hot baths, hot tubs & chlorinated pools for several days.